Lathe threading operation is designed for the threading by turn cutter or thread chaser. Helical surface forming is performed by the simultaneous spindle rotation and linear tool motion. Operation allows to thread as standard types of a thread (metric, inch, pipe threads etc. ), and threads with a non-standard tooth profile. The form of thread profile in the latter case is set by a separate curve. To make the thread it is necessary to make the three steps: define the start and end points of the thread, select the thread parameters and assign the machining strategy. The thread location is defined in the Job assignment window. 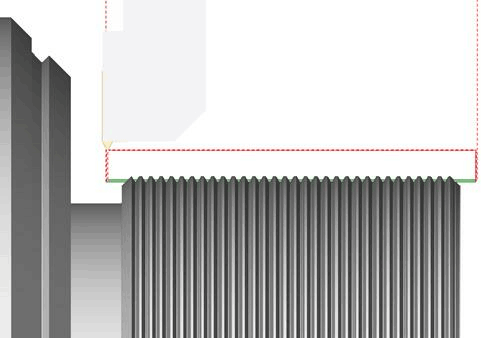 Where are a few way to define the start and end thread points: select the simple elements on a part generatrix (cut, arc), restrict the zone by axial or radial coordinates, define the curve segment from the start to the end point. The tool path calculation algorithm uses the start and end points only whichever way you use. 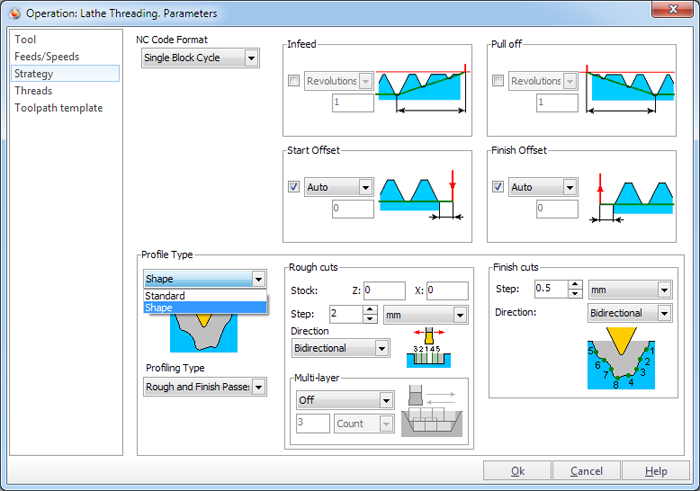 The geometrical parameters of a thread (external and internal diameter, step and etc) are taken from the operation parameters window from the <Threads> page. An lathe threading operation uses the first element from the job assignment list only. Create a few operations if its necessary to machine a few threads. There is a big extendable library of a thread geometrical parameters, so usually, if a required thread is a standard, then it's not necessary to set all parameters. It's enough to select the thread group and name. Other parameter will be filled from the database. 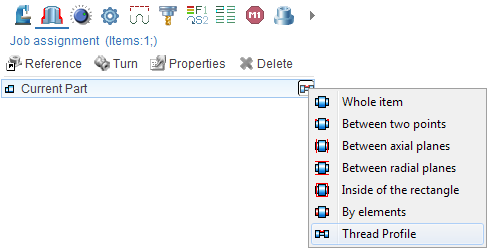 Select the <Custom> item to make the special thread. In this case all fields become accessible. The tooth profile to be shaped depends on the tool form and position. 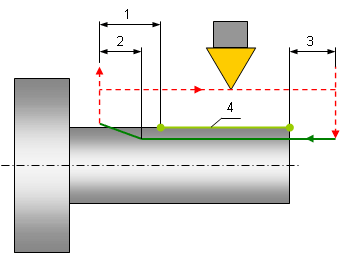 The defined thread angle is used for the tool path calculation but it is not synchronized with the tool position, so the tool parameters must be checked. The next step is the machining strategy assignment. All strategy properties are located on the <Strategy page> of the parameters window. Usually to make the high-quality thread it is cut in a few strokes. Strokes count is defined on the <Rough cuts> panel. The <Sequence> field defines the cavity volume removing strategy. Where are the next strategies: radial (plunge direction is perpendicular to the revolution axis), flank (plunge is performed by one of the tool side), alternate flank (changes the tool side) and modified flank (perform plunge with angle). With equal cut depth the cut area on the next layer is reduced and the tool loading is reduced. So where is the possibility calculate the depth to guarantee the constant tool load. The depth of the last pass can be defined separately on the <Finish cuts> panel. The <Spring cut count> determines the number of the passes with the zero depth. These passes are performed after the finish cuts. The correctness of the thread geometrical parameters is achieved if the start and stop points are located out of workpiece. This condition can be achieved with using the Start offset, Finish offset, Infeed and Pulloff. If you want to make the shape thread you must in addition specify in job assignment window the contour that defines the form of threaded grooves. After the curve is added, it is necessary to set correctly its start and stop points. You must also specify how this curve is associated with the contour defining the start and end point of the thread. In this picture green curve defines start (S point) and stop points of thread. Blue curve specifies the form of threaded groove. With red color on this contour is drawn a point (H point), which equalize by the height with the thread start point S. It is necessary to specify point H, because the curve, which defines profile, can lay in any place relative to threading start point. To switch operation to shape profile calculating mode it is necessary on page <Strategy> in operation parameters window set <Profile type> parameter as <Shape>. Then become accessible panels, defining a strategy of processing the threaded groove. It can be processed by rough and finish passes. Rough passages obtained sequentially by moving the tool along the axis of rotation with a fixed step and can be divided into several layers. Finish passes obtained by moving the tool with fixed step along contour length. The parameters of the approach to the start point and return parameters can be defined on the Approaches/returns page. Here the coordinates of the start and end points are accessible. The operation can generate the thread cycles or the simple commands: motions, feedrate and delay that describe the cycle. <NC code format> field control this feature. The simulation mode allows the checking of the thread shape. 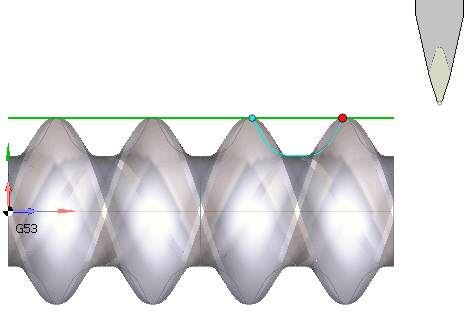 The cylindrical grooves are displayed instead the helical surface; because the simulation feature.